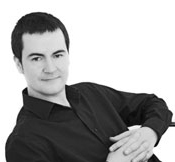 Darragh Morgan played violin with the Millennia Ensemble on the album Absent Friends. As such Darragh has also played for many other artists than The Divine Comedy including Travis, Paul McCartney or Brian Kennedy. Moreover, Darragh has played for many ensembles including Ensemble Modern, The London Sinfonietta, Musik Fabrik, The Ulster Orchestra. He is also a member of The Smith Quartet, the music collective Noszferatu. Darragh Morgan is also a Professor of Violin at The Royal Welsh College of Music and Drama and The Guildhall School of Music and Drama. He also gives lectures on extended violin techniques recently at Queens University Belfast, Trinity College Dublin and King’s College, London.